Valid from 25-28 Apr 2019. While stocks last. 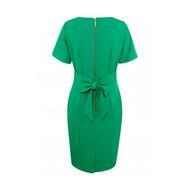 This classic Closet London shape is on-trend for the summer season with a vibrant green colour. The smart tie in the back allows you to fit it around your waist.